I was visiting St Andrews for a Union debate. St Andrews is one of my almae matres. It was where I did my PhD. How pleasant to be back among the grey stones and red gowns of Scotland’s oldest university, one this year celebrating its 600th anniversary. The students were just as bright, alert and engaging as ever, and conversation went on late into the night afterwards at the West Port tavern, located appropriately enough next to the West Port, one of the old city gates. Next morning at my hotel breakfast I saw a “Full Scottish Breakfast” on the menu. I know and sometimes enjoy a “full English,” but this was new to me. 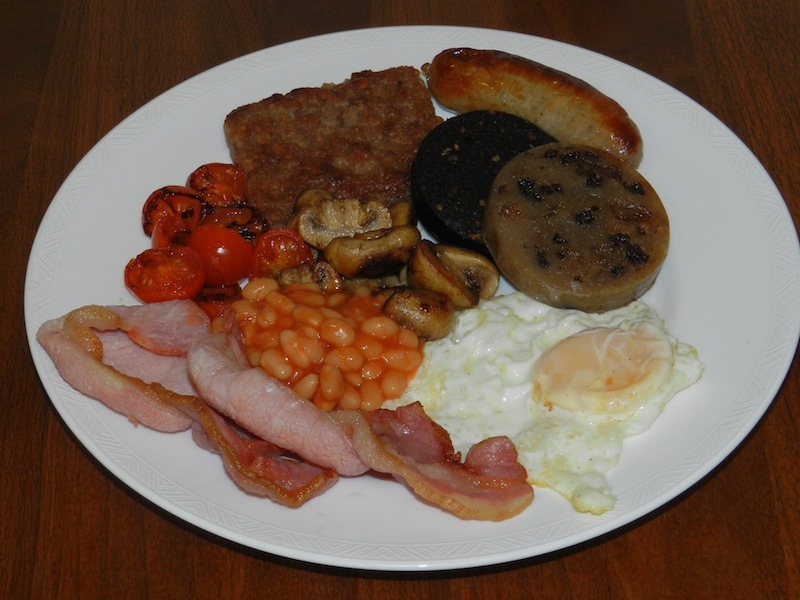 It consisted of “sausage, bacon, egg, haggis, black pudding, potato scone, beans, mushrooms and tomato.” Wow! I didn’t eat it, but opted instead for scrambled egg with (masses of) smoked salmon. It did set me thinking, though. I guess if you’re about to set out on a challenging golf course in a force 9 gale, it might be just the thing to sustain you, but I have to say that it looks intimidatingly calorific. At a rough guess I would say there’s probably more than a day’s quota of calories in that plateful. I note that Scotland has a problem with obesity, with roughly 28 percent of adults and over 30 percent of children classified as obese, and about 64 percent of Scots reckoned to be overweight. No doubt eating habits that include the infamous deep fried Mars bar have something to do with it, plus a fondness for the sugary foods that once were the luxuries to enliven an otherwise plain diet. I think I’ll carry on with my porage every morning, which I note was spelled ‘porridge’ in the English style on the hotel menu, presumably for the benefit of the American golfers who stay there. Your Scottish experience with haggis reminds me when I was in my teens and my two Scottish cousins (both kilted) visited with their parents for a few days. They were Aberdonians and haggis was sometimes ‘ on the menu ‘. We visited a local fish and chip shop and lo & behold, they had battered large sausage sized haggis on the menu. Needless to say they both went for that but the man at the range upon hooking the haggis out of the pan, stabbed it two or three times with a fork as he rested it with the chips, ” phit did ye de that fer “, asked my cousin……..just to make sure it was dead came the reply. It’s impossible to repeat the reply from my cousins because their Aberdonian dialect was indecipherable. Your full Scottish breakfast sounds wonderful. Its make me so hungry. This is like good diet tips for a good health. Thanks!